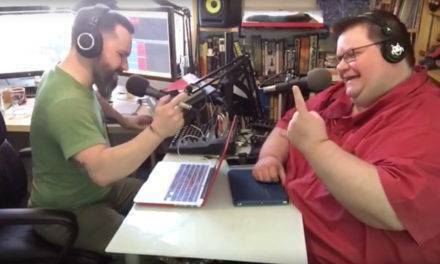 Welcome to Episode 101 of the Two-Headed Nerd Comicast! Plus, we present the highlights from our THN 2nd Birthday Spectacular live Q&A, including the ill-fated Skype experiment! Hey! Don’t forget to check out our all-new, web exclusive feature, Answer of the Week, available ONLY at TwoHeadedNerd.com, where we answer the latest Question of the Week! Floating Bunny Head #1 by Jonathan Sims — Click HERE for more details about FBH! Our theme music is A Better Tomorrow by Dan the Automator. Other music found in this week’s episode was provided by the following sources: Big News Theme — Here is the News by ELO, Ludicrous Speed Round Theme — Fury of the Storm by Dragonforce featuring Dark Helmet, Superbowl Shuffle by Superbowl Superstar, What the F$&# by Boss Hog, Arcade Blues by Neon Indian, Never Let Me Down Again by Depeche Mode, Worldwide March by Sam Spence, Very Friendly by Throbbing Gristle, Birthday Dethday by Dethklok, Ape Uprising by Slough Feg.